We woke up today to sunny skies and had a nice breakfast (included in the hotel package) at the 3rd floor before heading out to Petronas Twin Towers and Suria KLCC Mall via the hotel's free shuttle service (if your hotel does not provide shuttle service, you can try travelling by MRT or get a cab). 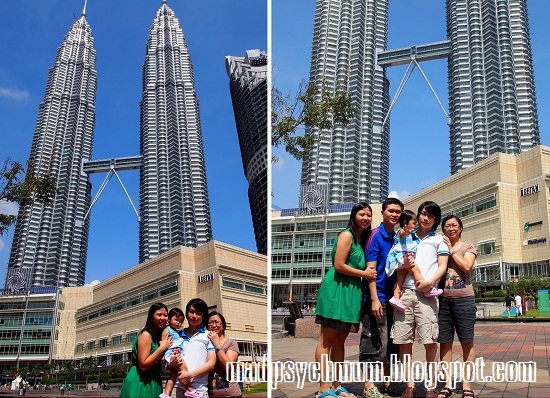 Since we couldn't visit the Petronas towers the last time, we thought we could visit it this time. Unfortunately..
..the tickets were SOLD OUT!! We had little choice but to have fun with a video camera and take pictures of the towers from the outside (once again). We took a blue cab (as advised by our driver yesterday) from the taxi queue and had to pay a surcharge of RM2, which I thought was way better than having to overpay for a regular cab and then having to 'see his face' (literal translation of 看他的脸色 'kan ta de lian se'). Blue cabs run by the meter and costs exactly what our shuttle driver said it would cost us (i.e. RM13). As it rained suddenly, we decided to take away lunch from the restaurants across the street from our hotel. The 饺子 'jiao zi' (dumplings) that we bought from the restaurant, which prides itself on being 水饺大王 'shui jiao da wang' (king of dumplings), was really tasty and not too dry or salty. 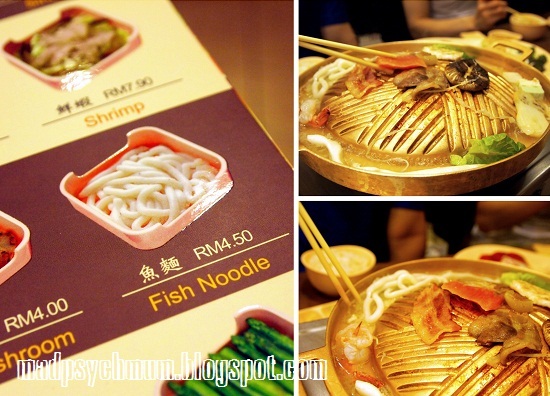 The wanton mee we bought from a few shops down was also really springy and value for money. *yum*! We probably shouldn't have gone swimming straight after such a heavy meal but we did anyway since the sun made its appearance in the sky and we were so afraid it might go away again. Baby girl finally had the chance to wear her brand new swimsuit for the first time! She was so excited she was jumping around in anticipation. The pool was pretty empty except for a Caucasian woman who was basking in the sun hoping to get a tan. 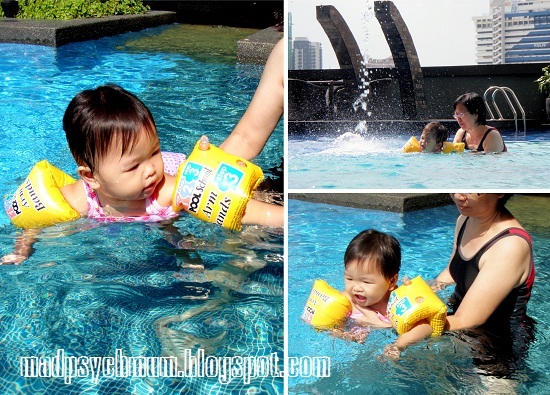 We put arm floats on her and let her go solo a few times but she was really afraid and clung onto us. We let her go solo anyway just to let her instincts to swim kick in. Judging from the video, it might take just a little bit more time for that instinct to kick in *laughs* Poor girl. She didn't want to leave the pool but as a strong breeze started to blow and dark clouds started to loom, I decided it was time to go or we'll all catch a chill. We headed over to Berjaya Times Square again for dinner at Bar.B.Q Plaza, which had a long queue and looked pretty unique. 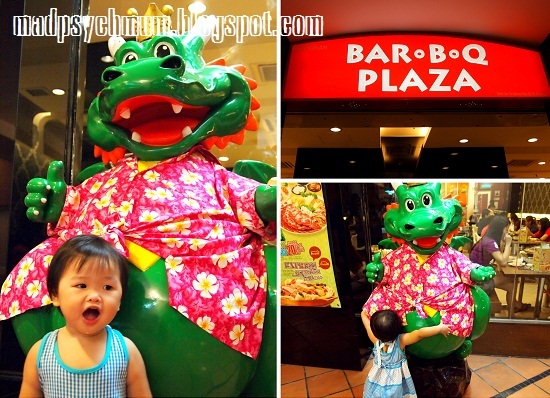 With Bar.B.Q Plaza's Mascot, 'Mr Hawaiian Dragon'! 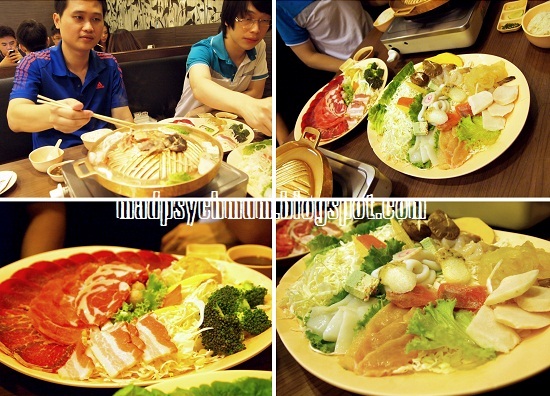 We ordered the family set meal which comes with assorted beef, pork, chicken and seafood. Our feets were aching and we were so drained by the end of the day, we slumped onto our comfortable beds and snoozed till the next morning!